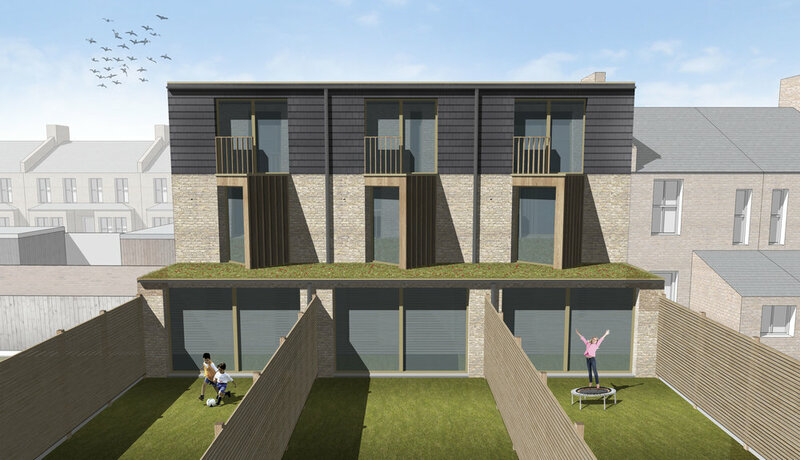 MTA won planning permission to erect three 3-storey houses and a 3-storey flatted development containing five self-contained flats in East Dulwich. The Royal Mail Delivery Office that occupies the site is to be demolished while maintaining its front Victorian elevation and incorporating it into the design and massing of the flatted development. The three proposed houses feature modern detailing and materials while finishing the existing row of houses, maintaining the building line. The contemporary materials and details, expressed on the design of the front and rear elevations, harmoniously integrate into the rest of the street. Sliding doors open up the ground floor of the houses into large, rear gardens which are complemented by the sedum planting, present on every floor of the buildings. The flatted component modernises and integrates the ornate Victorian elevation onto Silvester Road while introducing new windows to suit the proposed flats behind. The rear elevation gradually cascades the height of the building to the rear ground floor gardens through a stepped design with sedum roofs on every storey of the building.